A difficult 9/11 question for prayer. September 11th is a date seared into the collective consciousness. The suicide attacks on the towers in New York leading to thousands of deaths were broadcast on video round the world were an example of deluded religiosity. Those perpetrating the attacks firmly believed that what they were doing was right and that they would be rewarded by God on a grand scale after death. They were horribly mistaken and will be finding out in the presence of the almighty and holy God just how much he disapproves of such vainglorious violent behaviour. 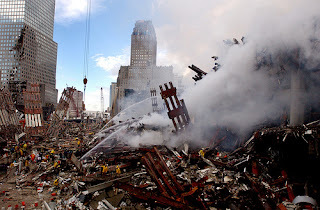 Those who were killed in the towers and there families were not sinful to any greater extent than anyone else and yet they had died in hideous fashion. After death they went to be with God who as well as being just is also merciful and the very definition of love. A more difficult question is how we should respond. We can approach a good answer to this by asking another question. Imagine a person such as the survivor who works for Deutsche Bank. This man had popped out for a coffee at the time of the attack. How does he respond to the attack? Do we respond differently because we have a greater distance and time from the attack? I reflect on this question in this episode of Daily Devotional Preaching.